Close combat is indispensable and unique to land operations. Only on land do combatants routinely and in large numbers come face-to-face with one another. When other means fail to drive enemy forces from their positions, Army forces close with and destroy or capture them. The outcome of battles and engagements depends on Army forces’ ability to prevail in close combat. 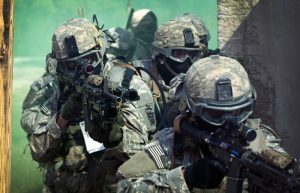 Paratroopers assigned to 1st Battalion, 508th Parachute Infantry Regiment, 4th Brigade Combat Team, 82nd Airborne Division, prepare to enter a building as they conduct close quarters combat training during an air assault mission. The complexity of urban terrain and density of noncombatants reduce the effectiveness of advanced sensors and long-range and air-delivered weapons. Thus, a weaker enemy often attempts to negate Army advantages by engaging Army forces in urban environments. Operations in large, densely populated areas require special considerations. From a planning perspective, commanders view cities as both topographic features and a dynamic system of varying operational entities containing hostile forces, local populations, and infrastructure. • Honorable servants of the Nation. • Competent and committed professionals. • Dedicated to living by and upholding the Army Ethic. • Able to articulate mission orders to operate within their commander’s intent. • Committed to developing their subordinates and creating shared understanding while building mutual trust and cohesion. • Courageous enough to accept prudent risk and exercise disciplined initiative while seeking to exploit opportunities in a dynamic and complex operational environment. • Trained to operate across the range of military operations. • Able to operate in combined arms teams within unified action and leverage other capabilities in achieving their objectives. • Able to apply cultural understanding to make the right decisions and take the right actions. • Opportunistic and offensively minded. Effective close combat relies on lethality with a high degree of situational understanding. The capacity for physical destruction is a foundation of all other military capabilities, and it is the most basic building block of military operations. Army leaders organize, equip, train, and employ their formations for unmatched lethality over a wide range of conditions. Lethality is a persistent requirement for Army organizations, even in conditions where only the implicit threat of violence suffices to accomplish the mission through nonlethal engagements and activities. An inherent, complementary relationship exists between using lethal force and applying military capabilities for nonlethal purposes. Though each situation requires a different mix of violence and constraint, lethal and nonlethal actions used together complement each other and create multiple dilemmas for opponents. Lethal actions are critical to accomplishing offensive and defensive tasks. However, nonlethal actions are also important contributors to combined arms operations, regardless of which element of decisive action dominates. Tactics is the employment and ordered arrangement of forces in relation to each other. Through tactics, commanders use combat power to accomplish missions. The tactical-level commander uses combat power in battles, engagements, and small-unit actions.